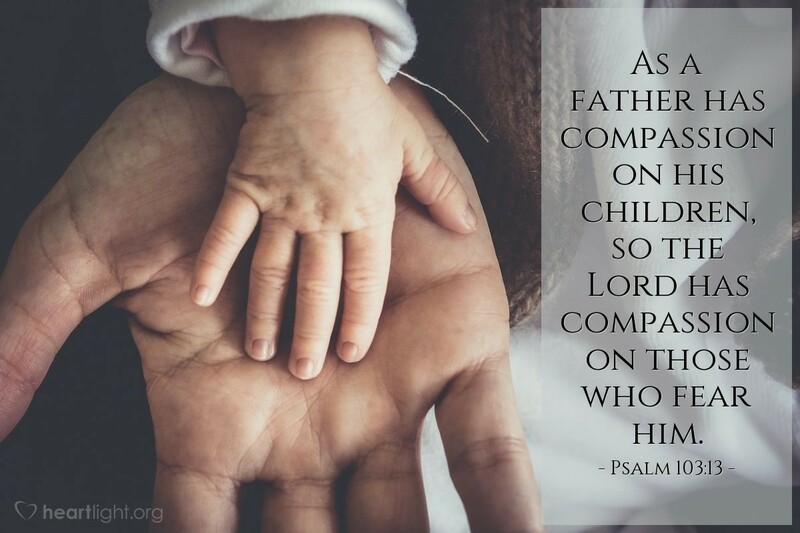 As a father has compassion on his children, so the Lord has compassion on those who fear him. Compassion. Not pity, not anger, not shame, not impatience, not intolerance, not rejection, but compassion is what God, my Father, gives to me. He cares for my pain enough to enter into my world and share it in Jesus. Father of Mercies and God of all Compassion, thank you for not only knowing and caring about my struggles and problems but sending me help in Jesus and the Holy Spirit. By one I know your love and mercy and by the other I know your might and power. May your Spirit of compassion be found in my relationships. Through the grace of Jesus I pray. Amen.